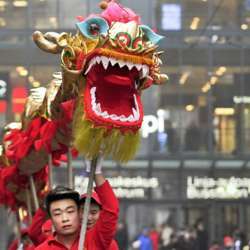 Come and join the celebrations of the Chinese New year. It will be a year of pig. This year the festivity takes place in Protected content . There will be performances and some groups came from Beijing and Chinese New Year Market selling souvenirs and tasty food. The evening will end with fireworks over Töölönlahti. We will look at the performances and walk around the market. These are in a circle shape in a square. Bring cash, not all stalls accept cards. The meeting point is Protected content . If you are late, follow the tracking in google map. Dress warm and in between we might go somewhere inside to warm up.